Subscription boxes are everywhere. From makeup to food to dog treats, there isn’t a subscription box that will not meet your needs. I had been looking for a great box for my daughter as she loves to get packages, even if they are for mom or dad. I was looking for her to get a package in her name that contained stuff that would be exciting for her. Enter the Koala Crate by Kiwi Crate. This particular box is designed for children from the ages of 3 to 4, but they offer boxes that go up to the age 15. 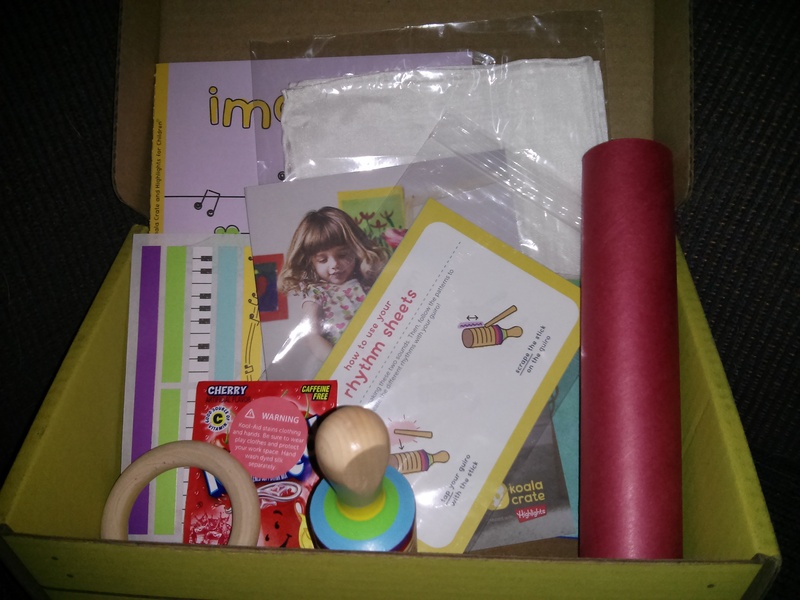 The boxes range from crafts to science-based explorations. The Koala Crate a crafting crate with a monthly theme. Her first crate was based on music. Contents of the Koala Crate. Her kit included the supplies to create a trumpet (which actually sounded like a kazoo in the end), a dancing ribbon, and had a pre-made wooden music instrument called a Guido. It also came with all the instructions on how to assemble (and the amount of supervision needed) and a little Highlights books to read and play with. We first made the trumpet, which had Gabi put stickers on to decorate the cardboard tube. The only thing I helped with was putting on the tissue paper, rubber band, and poking the holes. It was a fun little craft that we got to do together. We went back and forth and made the kazoo-like noise with the trumpet until her attention went elsewhere. The “elsewhere” was hiding away from us and picking off all of the stickers from the trumpet and removing and throwing away the tissue paper and rubber band. The stickers are now part of the wall. Don’t worry folks, they’re actually great and easily peeled off if they end up anywhere they shouldn’t be. The Guiro came with sheets on different types of rhythms to do. It was made of solid wood and very high quality. We had fun experimenting with it and making different sounds. So far not much progress has been made, but with this and a drum we would be able to get her rocking in a two-woman band. Our final project was a dancing ribbon. What was included was white silk, cherry kool-aid, and a wooden ring to loop the silk through. This was by far the messiest project, but I as the responsible adult I took over and mixed the Kool-aid and dyed the scarf. Thankfully this responsible adult didn’t tip the bowl or spill as she is well known to do. We haven’t had a chance to dance around with the scarf, but I know as soon as Lindsey Sterling is played in our house it will be a big hit. Finally, the small book itself is a collection of fun activities that Highlights is known for, a find it, a story, poem, and other little fun activities that relate to the theme of the box that you have. Gabrielle opening her first crate. Overall, I was very impressed with the box. The activities are fun and engaging, even for someone with a 1 minute attention span. These boxes are designed for you to move, discover, explore with your child while encouraging creativity and learning. The crafts were high quality, especially for the price of the box. 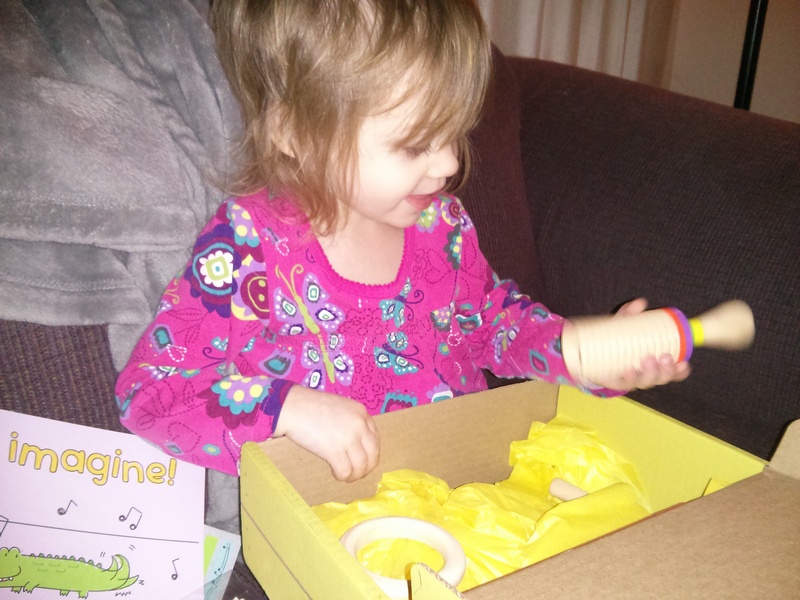 I know after going through the activities and seeing the delight on her face as we put together the new crafts or made new noises, this is one monthly box that we will continue to order. When Kelly is not busy fighting evil with her three-year-old wannabe wizard (who loves to slay monsters with her sword), she is reading any genre of fantasy she can get her hands on, working on her website, or watching Supernatural.